Consider an undirected and vertex-weighted graph modeling a social network, where the vertices represent individuals, the edges do connections among them, and weights do levels of importance of individuals. In the competitive diffusion game, each of a number of players chooses a vertex as a seed to propagate his/her idea which spreads along the edges in the graph. The objective of every player is to maximize the sum of weights of vertices infected by his/her idea. 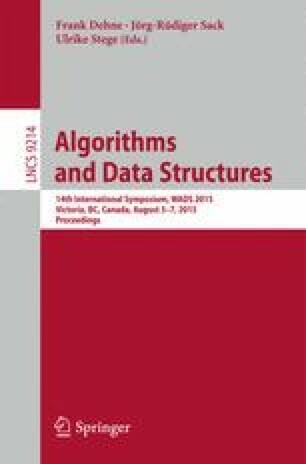 In this paper, we study a computational problem of asking whether a pure Nash equilibrium exists in a given graph, and present several negative and positive results with regard to graph classes. We first prove that the problem is W-hard when parameterized by the number of players even for unweighted graphs. We also show that the problem is NP-hard even for series-parallel graphs with positive integer weights, and is NP-hard even for forests with arbitrary integer weights. Furthermore, we show that the problem for forests of paths with arbitrary weights is solvable in pseudo-polynomial time; and it is solvable in quadratic time if a given graph is unweighted. We also prove that the problem is solvable in polynomial time for chain graphs, cochain graphs, and threshold graphs with arbitrary integer weights.